Looking for an easy dessert for a Spring dinner, or a summer treat? 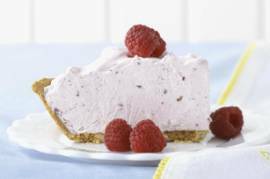 This pie uses 3 ingredients that most people have in their refrigerator already, and with a quick fruit garnish, you have a delicious low calorie treat for those hot afternoons! Thaw frozen non-dairy topping and mix well with yogurt. Pour into graham cracker crust. Refrigerate for 1 hour, and garnish with assorted fruit if desired. Serve chilled.